"Instant coffee powder adds intrigue to these rich, chewy bars." Preheat oven to 325 degrees F (170 degrees C). Grease a 9 X 13 inch baking pan; set aside. In a large mixing bowl, beat butter, 1 cup brown sugar, instant coffee powder, 1/4 teaspoon cinnamon and 1/4 teaspoon salt until light and fluffy. Stir in flour 1/2 cup at a time, blending well after each addition. Spread evenly in prepared pan. Bake 20 minutes. Cool in pan on rack 15 minutes. In a large bowl, beat eggs and vanilla with remaining 1 cup brown sugar, 1/4 teaspoon cinnamon and 1/4 teaspoon salt. 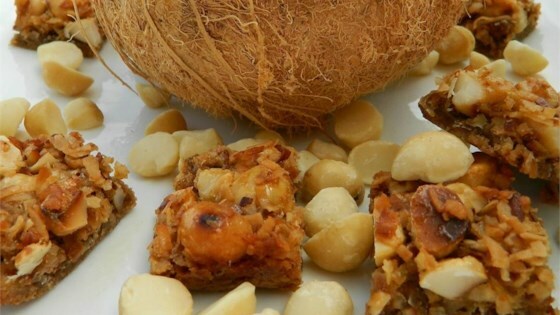 Stir in coconut and macadamias. Spread evenly over cooled baked layer. Bake 40 to 50 minutes, or until golden brown and firm to the touch. Use a knife to loosen cookies around edges while warm. Cool completely in pan on rack. Cut into 48 (about 1 1/2 inch) squares, cutting 6 strips one way and 8 strips the other way. Store in an airtight container at room temperature 1 week; freeze for longer storage. SO GOOD! The instant coffee granules give it a unique, can't-quite-put-your-finger-on-it taste. YUMMY! I served these at a Luau themed bridal shower and they were a hit. These bars are easy to make and very good but a little sweeter than I would have liked. I made them for my sister and she just loved them. These were great, except the instant coffee I had was WAY too strong, so much so that I had to start the butter/sugar part over, then I only put a bit in. My husband's college class loved them. Terrific! Another Hawaiian type recipe that went over beautifully at a party. Made these exactly as instructed for an Hawaiian Themed Gourmet Club. Everyone loved them. Easy to make ahead of time and easy to serve. Coffee absolutely did not overwhelm the recipe.